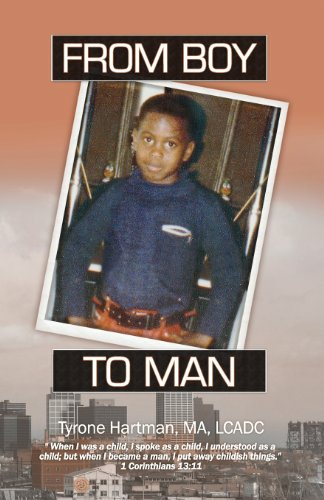 "From Boy to Man, provides compelling insight into a young boy's journey of a "concrete jungle king" on the streets of Newark, NJ. Tyrone gives a vivid description of his heartfelt experiences of a person desperate to survive, destined for doom, and becoming just another incarcerated young and under-developed man. He then takes a dedicated turn to become a mature, successful, self-made man that began with courage to change. Applying his knowledge of human nature, he reveals the urgent need for society to reclaim the value of our men as providers and protectors of their family and community. This book is much more than a message of hope and redemption; it is a riveting account of a passion to live. He let us in to an amazing story that can help all of us become more than we dream to be." The book then moves readers into a Life Coaching segment as the author passionately discuss topics and ask the reader to reflect and write down their thoughts. The book provides a journaling opportunity. This book is a great experience!